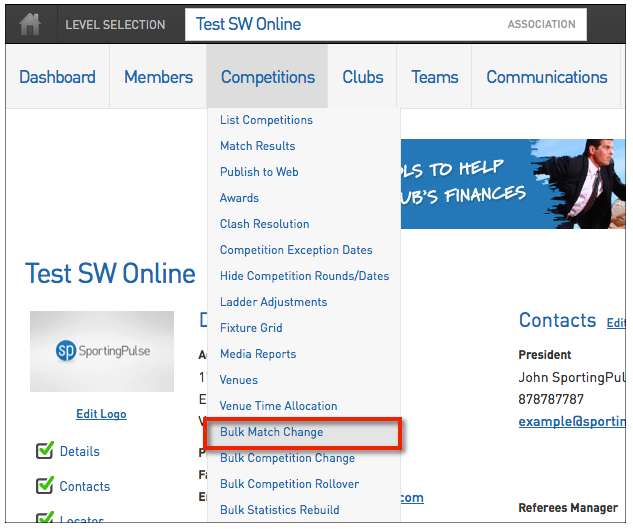 The bulk match change function allows bulk changes to be made to fixtures to a single specific competition or across multiple competitions in the database. 1. Hover over Competitions and click Bulk Match Change. 2. At the next screen you can select which Competitions and which specific matches within the selected Competition(s) you wish to make bulk changes to. First highlight the Competition you wish to make bulk changes to. You can choose multiple Competitions by clicking next to the Competition name that you have previously added. 3. You can then add filters to further limit the matches that you are going to want to change. You can select to display matches between a specific date and time ranges, matches from a certain round and matches taking place at a particular venue or at several venues. NOTE: If you leave all of these filters blank then you are going to be given the choice to bulk change every match in the highlighted competitions. 4. Once you have selected the competitions you want to bulk change and inputted any further filters click the Search for Matches button to proceed. 5. At the next screen you can input the changes you wish to make in bulk. You have the options to move all the selected matches (see tick boxed below) to a new Match Date, a new starting Match Time, to a new Venue or you can add a Match Description to these matches. The Match Description will display on the SportsTG Standard Website directly above the two team names in the fixtures section. Simply input the changes you wish to make into the appropriate boxes. NOTE: You now have the ability to hide a match within a ladder and also hide player statistics for matches that have already been played. To do this, simply choose a date range (one that covers the match you wish to change), click Search for Matches and choose 'Yes' in Hide Match in Ladder' and/or 'Hide Match in Stats'. Click 'Apply Changes to Matches'. 6. Finally you need to check that the matches ticked below are the matches you wish to bulk apply these changes too. You can un-check any of the matches that you do not want to apply these to, however if matches you want to change are not displayed then you will need to go back a screen and search for matches using different filters. 7. Once you have got ticked all the matches you wish to apply the changes too click the Apply Changes to Matches button. The matches will be changed accordingly.